Now that you have completed all of the previous steps in our guide to sharing OS X Mountain Lion files with Windows 8, it's time to access them from your Windows 8 PC. There are a number of ways to access your Mac files; here are some of the easiest and most popular methods. The Network place, available in the File Explorer, is the place to go when you want to work with files you're sharing on your network. The method you use to get there depends on whether your Windows 8 PC is using the Desktop view or the Start page view. Because we'll be working in the Network place a great deal, we'll show you how to get there from both starting points. Later in this guide, when we mention the Network place, you can use whichever method is appropriate to get there. 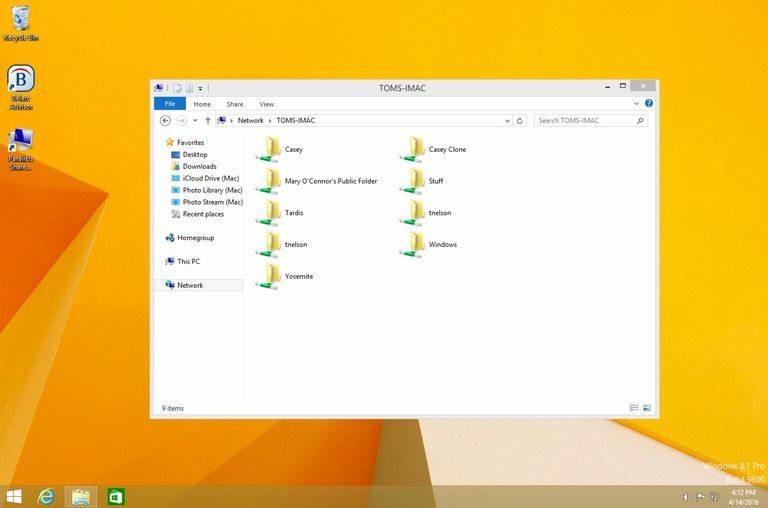 From the Desktop, click the File Explorer icon in the task bar at the bottom of the screen. Once the File Explorer window opens, click the Network item listed in the sidebar. From the Start page, right-click in an empty spot and select All Apps from the bottom bar. In the list of apps, click the File Explorer icon, and then select the Network item, which is located in the File Explorer sidebar. Go to the Network place in File Explorer. The IP address you entered should now appear in the File Explorer's sidebar, just below the Network item. Clicking the IP address in the sidebar will display all of the folders on your Mac that you've set up to share. //MacName (replace MacName with the network name of your Mac). Of course, this still leaves you with the problem of always needing to enter either the IP address or the name of your Mac when you want to access shared files. If you'd like to access your Mac's files without always entering the Mac's IP address or network name, you may prefer to use the following method. By default, Windows 8 has file sharing turned off, which means your Windows 8 PC doesn't actively check the network for shared resources. That's why you have to manually enter the Mac's IP address or network name every time you want to access shared files. But you can automate that process by turning file sharing on. Open the File Explorer if it isn't already open, and then right-click the Network item in the sidebar. In the pop-up menu, select Properties. In the Network and Sharing Center window that opens, click the Change Advanced Sharing Settings item. In the Advanced Sharing Settings window, you'll see a list of network profiles that include Private, Guest or Public, HomeGroup, and All Networks. The Private network profile is probably already open and displaying available sharing options. If it isn't, you can open the profile by clicking the chevron to the right of the name. Turn on File and Printer Sharing. Return to the Network places. Your Mac should now be automatically listed as one of the network locations you can access. If you don't see it, try clicking the reload button to the right of the URL field. Your Windows 8 PC should now be able to access the folders on your Mac that you've marked for sharing.